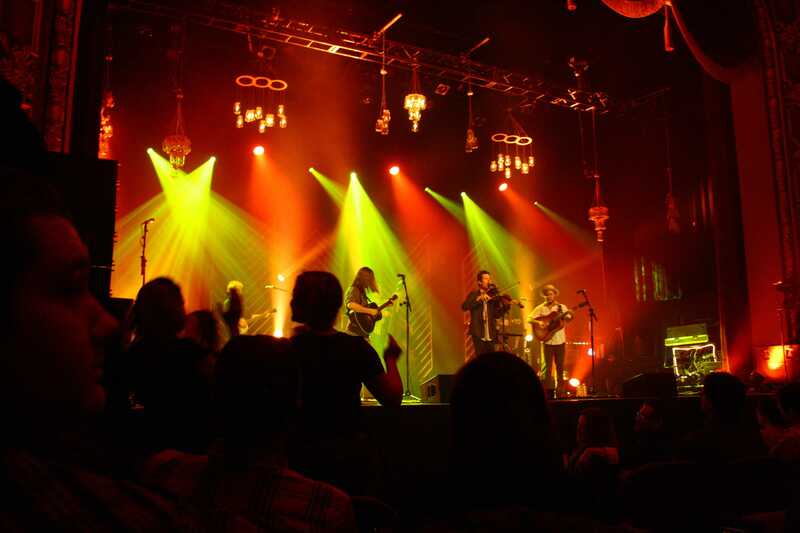 The dramatic lighting and completely rustic set gave the performance a folksy, energetic feel. Bluegrass bands always draw an interesting crowd, and Old Crow Medicine Show was no exception. The audience’s apparel ranged from cowboy boots and Levi jeans to Corduroys and vintage v-necks, and the crowd they drew at the Missouri Theatre Dec. 5 was a diverse group of ages and ethnicity. Their most recent concert assembled one of the most diverse bodies of people I’ve seen in a long time. O.C.M.S. aims to please a wide spectrum of fans, and the crowd proved a testament to their ability to bring people together. For those who are unfamiliar with the group, O.C.M.S. is a bluegrass band that pushes the boundaries of its genre. Their certified gold single, “Wagon Wheel,” earned them fame throughout the entertainment industry, and even people who have never heard the name O.C.M.S. tend to start singing along when the band comes on the radio. “Wagon Wheel” encapsulates the heart and soul of the band; it’s got catchy, quirky lyrics describing a cross country trek across the United States and recognizably Southern roots, but it’s cheerful vibes and original sound give it a mass appeal. “Wagon Wheel” has become their most widely renowned song, and it killed at the concert, putting the already excited crowd into a frenzy as the song echoed throughout the audience. The band provided the audience with an exuberant atmosphere for the entire night; all O.C.M.S.’s members, especially frontman Ketch Secor, have a wonderful stage presence and keep their listeners engaged. The start of the evening wasn’t quite so exuberant, however. The opening act, Chuck Mead and the Grassy Knoll Boys, thrilled some audience members but left others who were not huge fans a little put out. They managed to play a mean cello, and their vocal harmonies were stunning, but they were definitely leaned a little more to the far side of the country music spectrum, and their self-proclaimed hillbilly feel was a stark contrast to O.C.M.S.’s breath of fresh bluegrass air. Still, the Grassy Knoll Boys weren’t a bad band, all in all, and the slight sour note they struck with some listeners did nothing to hinder the energy of the main event. O.C.M.S. played their way through all their well-known songs after taking the stage, and something became apparent very quickly as the audience became serenaded with O.C.M.S. classics like “Tennessee Pusher” and “Methamphetamine.” They aren’t just great live, they’re better live. Insanely better. The song “Humdinger” is really a rather forgettable track on an album, but on the stage, it becomes an emotional banjo-fest that is irresistible to dance to. Part of it’s how much the band strives to engage with the audience on a deeply personal level, but part of it’s the subtle ways they tweak their live music. O.C.M.S. isn’t afraid to play around with their songs when they’re in concert, and it makes a huge difference. Some of the songs aren’t even recognizable at first when they’re played live, with new instruments added in and the rhythms slightly altered. “Wagon Wheel” was not greeted with thunderous cheers until, a few seconds in, the audience realized what it was listening to. It was a completely brand new song, and in the absolute best way possible. The encore, featuring O.C.M.S. and the Grassy Knoll Boys side by side, didn’t disappoint but also didn’t prove particularly memorable. The two bands meshed together surprisingly well, though most of the songs were a step down in energy and originality from the singularly exciting climax the main event closed on. The finale was impressive, but the last few songs before O.C.M.S. first walked off the stage certainly left more of a lasting impact. It’s a great time for bluegrass; all sorts of bands are experimenting with the genre’s identity and bringing it to whole new listeners who wouldn’t even have considered bluegrass until five years ago. If you haven’t experienced O.C.M.S., go out and buy their album now. You’ll want to be familiar with their music in case you ever get to see them live. When they’re on the stage, O.C.M.S. will stun you with how much they can revolutionize your songs.